This past weekend, my brother and I, along with two of our best friends, went on a guided drift boat trip in search of the “fish of 10,000 casts”, also known as the Muskie. We headed to musky territory in Wisconsin, really the epicenter for this type of fishing. Muskellunge (Esox masquinongy) is part of the same family as pike. Its genetic lineage is unchanged dating back to prehistoric times, so you feel like you are hunting something fierce. The Muskie is the apex predator in its environment, and to catch one on a fly rod is truly an awesome feat. The name, Muskie, comes from the Ojibwa word for “ugly pike” (maashkinoozhe). It’s definitely an ugly fish. But it’s also extremely hard to catch, puts up a good fight, and makes for fantastic photos. This is the background for the epic trip I had in store for myself and my friends. We were all fired up, none of us ever having been in a drift boat with fly rods. Our guides were Brian “Lucky” Porter (www.faroutflyfishing.com) and Chris Willen (chriswillien.com). Lucky has guided us before, and it was our first time meeting Chris. Derek and John went into Lucky’s boat, and Adam and I went into Chris’ boat. This is our typical Davies versus Coleman competition of course, albeit a friendly competition of pride and honor. With regards to our hosts, I have to say that both of guides were amazing, and they really know their stuff. After a brief introduction to the world of Muskie casting (with heavy rods, and special bank shot lines), we shoved off the shore looking for glory in the depths of the river. OK, full disclosure: we got several Muskie eats but we did not put one in the boat. This is apparently very common in Muskie fishing (hence, the fish of 10,000 casts). At least, this was what I kept telling myself. My ego and pride were definitely hurting despite the good luck with the bass. It was a beautiful summer day though, with great friends and good conversation. Just because we weren’t able to catch any Muskies though didn’t mean we weren’t able to catch some awesome fish. I landed a 16 inch smallmouth bass to break open the skunk, and both my brother and I had a few more eats without setting the hook. This helped us ease into lunch time, and we finally felt we were getting the hang of the new casting style. There is a figure eight maneuver you are supposed to do with your rod at the end of the line strip to try to entice a Muskie to strike, and honestly, my brother and I thought this was somewhat comical. That is, until a Muskie came out from the depths of the water like the movie Jaws, causing me to forget all my knowledge, jump back, and pull my rod upwards, removing the hook from the musky’s mouth without setting the hook. The guide was right to chastise me, but that moment in an of itself was enough to get me hooked for life. I have to say a few things about our guide, Chris Willen. This guy is amazing. He was great company in the boat, extremely knowledgeable, and he gave us great direction and put us in the best position to catch fish. I highly recommend him to anyone interested in testing their mettle with big game fish like Muskie. Brian “Lucky” Porter also did an amazing job for my friends John and Derek, and having known him from our prior steelheading trip, I highly recommend him as well. The next part of the story is really what elevated this trip to epic status. Chris told us a story about some awesome fish previously hooked at the next hole, and sure enough, right after my fly hit the water, something big and fierce attacked my fly. In my shock, I didn’t quite strip set the hook properly, but to our amazement, the fish then proceeded to follow the fly again, and Chris started yelling: “it’s a hot fish, get your flies back in the water quick!”. The fish skirted away, but Chris told us we were going to have a do over with this fish, and we reset, rowed backwards, and informed the second drift boat behind us (Derek and John) that we were waiting to give it another go. After ten minutes of chatting and planning, we were ready to get serious. Sure enough, within five casts to that same exact hole, BAM!, a huge northern pike flew out and grabbed my fly. This time, I stripped like a mad man and we brought a 35 inch pike right into the net. We went ashore and got some amazing videos and photos. It was truly an epic catch. We released this apex predator back into the river, so it could continue to live its life at the top of the food chain. A pike that big doesn’t even need to worry about Muskie since it’s almost as big as them now. Here I am with guide, Chris Willen, holding the prize! That’s 35 inches of Northern Pike there. I landed another smallmouth bass, and we had a couple other Muskie eats with no hook sets later in the day. We think a small northern pike also took a pass at one of our flies, but that would be it for the fishing. After we brought the boats in, we all got to reminisce and recount the tale of the large Pike we were all privileged to see. The story lost none of its gusto when we added a couple Old Fashioned’s, some Single Malt Scotch and a ton of Bavarian food to ease ourselves back into the real world. Stay tuned for the video I’m editing, and remember to SET THAT HOOK! My grandfather fished dry flies, wet flies and streamers. And he was deadly at it. The same goes for my father, although he incorporated nymphs and emergers in his own arsenal. Always on the artificial fly. Always barbless hooks. I think something about this technique makes you a better fly fisherman. You develop that sixth sense that tells you when to set the hook at the faintest line twitch, the softest shudder, or that quick flash in the water as the fish turns over. This is what my father always referred to as purism or “being a purest” when it came to fly fishing. No strike indicator or split shot was needed. No hopper-dropper, thingamabobber, Czech lines, or drifts boats. It would be man (or woman) wading into nature’s home court, with the most primitive tackle handled in the most elegant way. 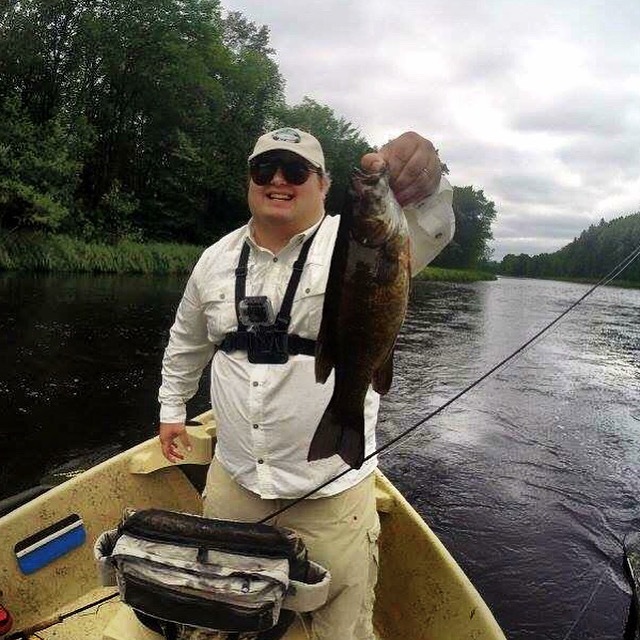 I was brought up learning to fish this way, and I think it really helped my brother and I hone our skills before we started introducing newer technical aspects of fishing for our own personal arsenal. I’ve got to be honest though. There’s nothing like making a trout rise to a single dry fly. But then again, I’ll do everything I can to catch a steelhead or that “fish of 10,000 casts” . . . muskellunge. These fish are so hard to catch, I’ll take any advantage I can get. For me, I just love being out on the river, with dreams of the last fish and thoughts of the potential next fish drifting through my thoughts. Whether it’s with split shot and jig hooks, or with a single barbless #12 Hendrickson (tied Catskill style of course . . . ), the way that you fly fish says a lot about your personality and style. And then of course, as my family always says, it’s almost as much fun looking at all that cool fly fishing gear as it actually fishing with it. I’ll continue to be an active participant as fly fishing evolves with new products and materials: bamboo, graphite, switch, Tenkara, anodization, disc drag, weight forward, sink tip, beads, flashback, tungsten, brassie, woven, jigged, choked, articulated . . . fly fishing is evolving like any other art form. So embrace all the new tactics and toys, and fuel your fly fishing addition with the next big thing.